Jesse Miller was born and grew up surfing in San Diego. He always wanted to go to Hawaii where the water was warm and the waves were good. When he started thinking about college, he learned about Brigham Young University-Hawaii, and couldn't think of going anywhere else. 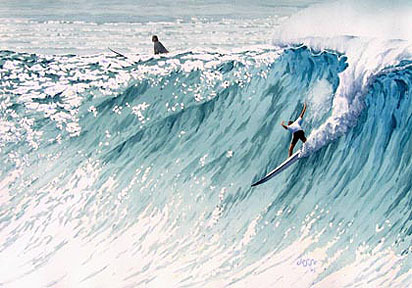 He enrolled as an art major, and when he got to Hawaii he found the surf was everything he had imagined, and an art program that was exactly what he hoped for. He started out like any beginning art student would, but learned quickly, and with patience and persistence, by the time he graduated in 1996 with Bachelors of Fine Art degree, he was winning awards in the college art shows. After living in Hawaii for six years, he came back to San Diego, to continue to paint. He soon got a job with the City of San Diego as a lifeguard. That lets him work at the beach during the summer, and gives him all winter to concentrate on art. 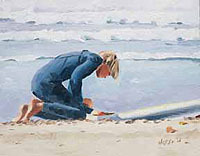 Being in touch with the ocean is important for both lifeguarding, and for what Jesse paints. 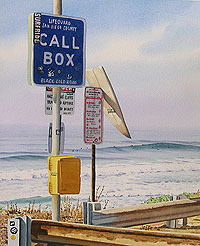 Almost all his work is inspired by what goes on like 500 feet in both directions from the shoreline. He explains it like this: "I like to show others what I see in life. My artwork is about what I look at, what I am about, and what I want to share with others." 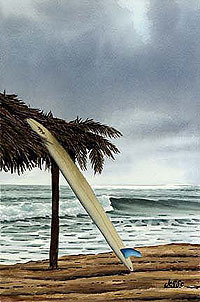 Not only the act of riding a wave, but the whole beach and surf culture surrounding it. There are millions of great surf shots published every month in magazines, so he looks to what goes on before, after and around surfing for his inspiration. He wants to show what those who surf see and take for granted every day. Jesse's style is more than just pretty pictures of the ocean. His work has been compared to both Andrew Wyeth and Norman Rockwell. Not because of technique, or color scheme, but because the artists are able to evoke a specific sense of time, place and emotion. Though he mainly works with watercolor, he also enjoys using oil paints and creating block prints. But the same dedication, understanding and philosophy all ignite all of his artwork. The paintings are more than people and places drawn convincingly, but art that lives and moves. Jesse's art has been displayed throughout Hawaii and California, and his work has been found by collectors all over the United States, and internationally. And, his main goal has remained the same: Sharing with a viewer the allure and beauty of the ocean and all that happens around it.